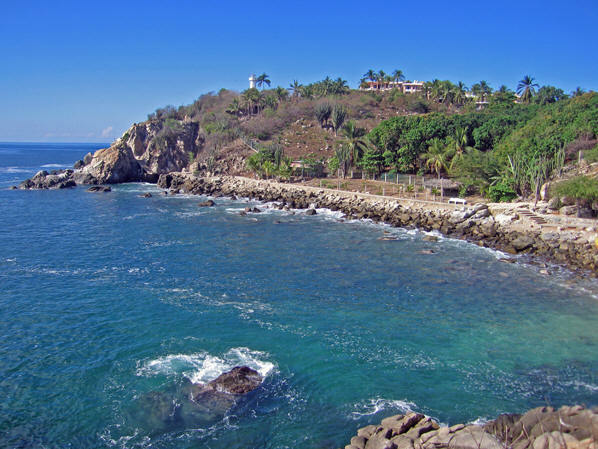 This was not our first trip to the beautiful seaside area of Puerto Escondido, and we were looking forward to our beach time there. On our previous trip, we had come down through the mountains by way of the city of Oaxaca. 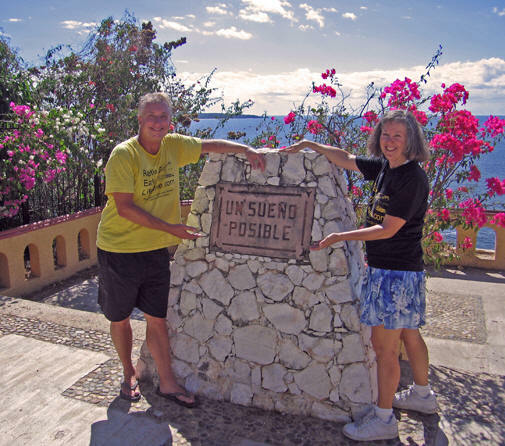 This time, however, we were leaving the almost unknown beach area of Marquelia and continuing on down the western coast of Mexico for our 3+ month excursion through Guatemala, Belize and the Yucatan. We caught the 5 a.m. bus from Marquelia to Puerto Escondido paying 200 Pesos per person for the 5 hour trip. From town we paid a taxi 20 Pesos to drop us off on Zicatela beach where we had reservations for a week at Hotel Las Olas. View of the quaint town from a higher vantage point. Or at least we thought we had reservations! Even though I spoke with Zazie, the owner, the day before by phone, and she had confirmed our reservations both verbally and by email, when we arrived at 10 a.m., none of her staff knows anything about our stay. The room we wanted wouldn't be available until later on that week, and on top of that, they wanted to charge us more than what was quoted earlier via email. This was an unsettling start to what was supposed to be a rejuvenating stay in a favored place. 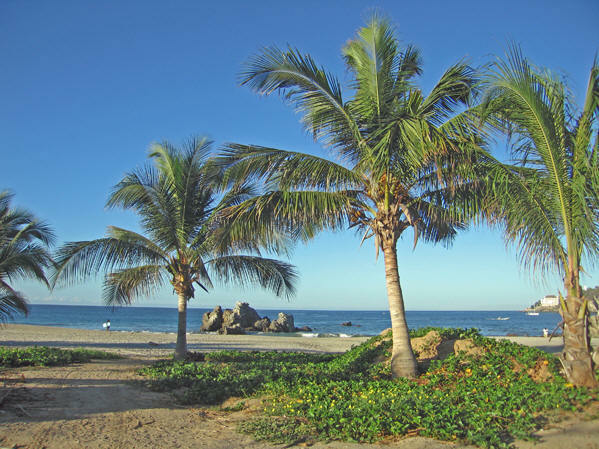 Clear blue skies, groomed beaches and sapphire seas make Zicatela an attractive beach destination. Eventually, after a bit of tug-and-pull with the employees at the desk, the boss was called and voila! An empty room for us appears. Our hotel is clean, convenient and an obvious value at the 300 Peso price for fan room, but the owners are known for their prickly attitude and their lack of communication skills with employees. 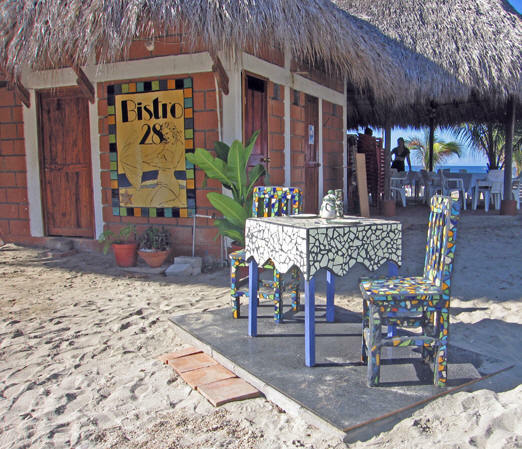 Mosaic tiled table and chairs beckon for customers to come in to this little seaside bistro. Development has been explosive since we were here a year ago, and artistically expressive cafes, restaurants and shops now line a newly finished main road which is done in attractively designed pavers. Serious surfers still flock here to Zicatela because the waves are perfect for board riding. A year ago the road ended right here at the attractive Hotel Arco Iris and turned into sand. Now it follows through another half mile with more hotel options, restaurants and shops lining both sides of the road. And the building continues. Our guess is that this persistent construction is going to attract a greater number of visitors making this area more upscale. 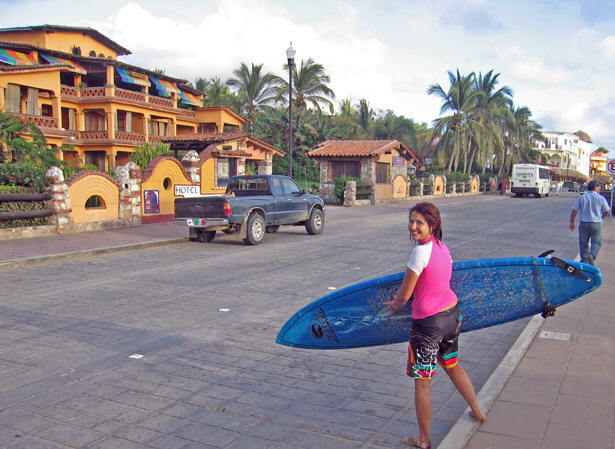 It's a captivating, clean town but now it leans towards a tourist beach-and-surf theme rather than reflecting the local lifestyle of the Mexicans. A typical surf shop that rents boards and has all the paraphernalia needed for the perfect ride. Development and growth is always a double edged sword. 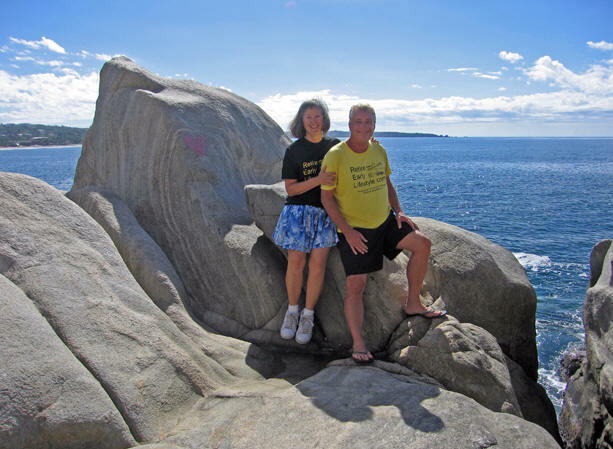 Tourists bring in cash flow that's good for business and improves the lifestyle choices of local residents. On the other hand, the authentic culture can be overwhelmed by the monolithic influx of internationals. 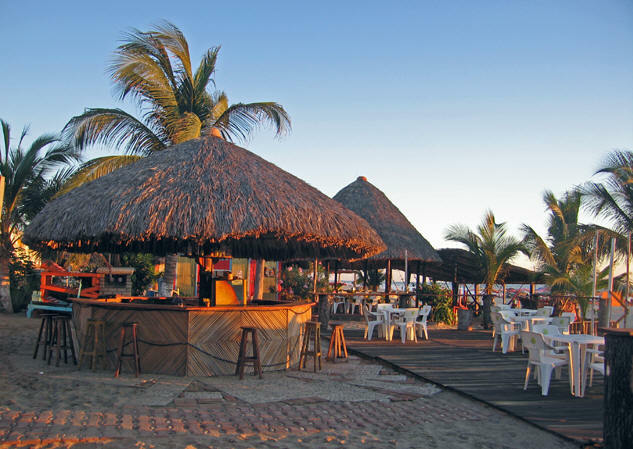 Palapa bars and small restaurants dot the entire length of Zicatela Beach. The main road is to the left in this photo with the sea to the right. This, my friends, is the local culture. 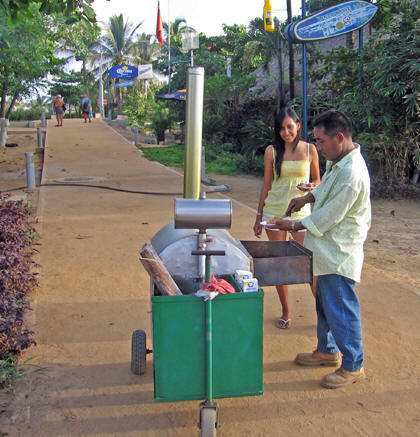 An independent vendor pushes his cart through the streets and sidewalks of town selling his roasted platanos. You know he is coming because he blows his whistle which sounds a bit like a train in the distance. Employees working in the shops run out quickly to purchase this tasty native treat. 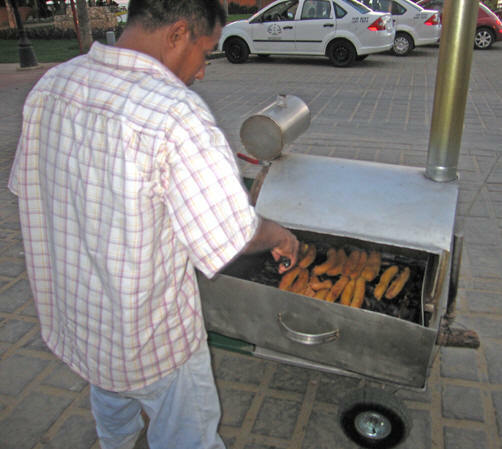 The plantain-style bananas are freshly roasted over the coals in his moveable grill which he pushes from place to place. So far, individual vendors are still allowed to sell their offerings and have not yet been asked to cease business by the larger restaurants and cafes. Notice the pavers done in appealing designs in the road. 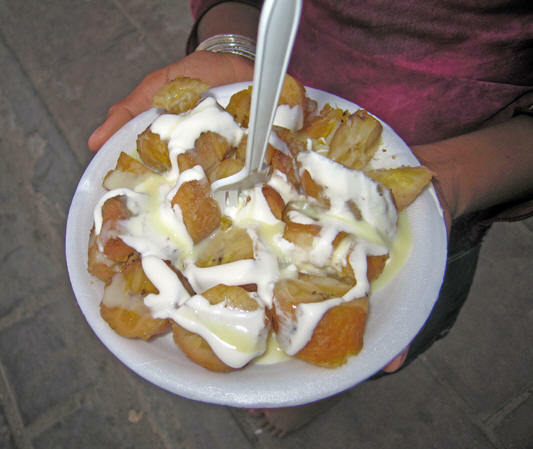 After sufficient roasting, this special style of banana (a heartier version than what we often purchase in the States) is cut into pieces and drizzled with fresh crema and sweetened condensed milk. This lady will now take her treat back to the workplace and share with a friend. Yummy! 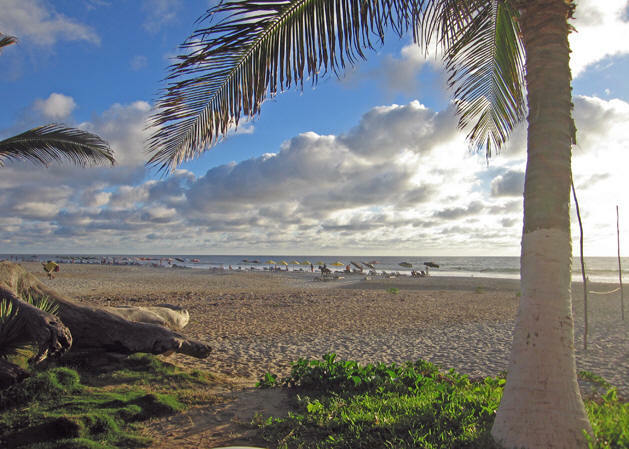 The vast expanse of Zicatela with umbrellas lined up along the shore. This is the location where surfers enjoy substantially sized waves. Swimmers are encouraged to swim elsewhere as there is a very strong undertow here. You have been warned! We witnessed a rescue at this beach, straight out of the TV show Bay Watch, complete with lifeguards jumping into their quad, blowing their whistles, swimming at an angle so the undertow would take them directly to the damsel in distress, through the pounding surf and sometimes 10 foot waves, and of course, flotation devices. Afterwards, the grateful-yet-chastened woman was instructed on where and why it's best to swim elsewhere. After witnessing all that beach drama it's time to enjoy a private table view of the sunset at Tio's. 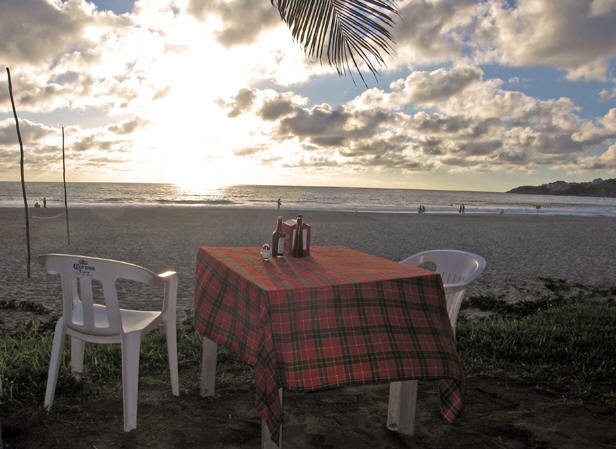 Puerto Escondido is in the Mexican state of Oaxaca, and one of the specialties of this area is Tinga, or stew. I ordered the Tinga de Pollo which is a slightly spicy, slightly sweet, smokey chicken stew served with rice and black beans, and of course, fresh corn tortillas. Our very large entrees were served with hot bread and an appetizer for 45 Pesos per person, or just under $3.50 USD. 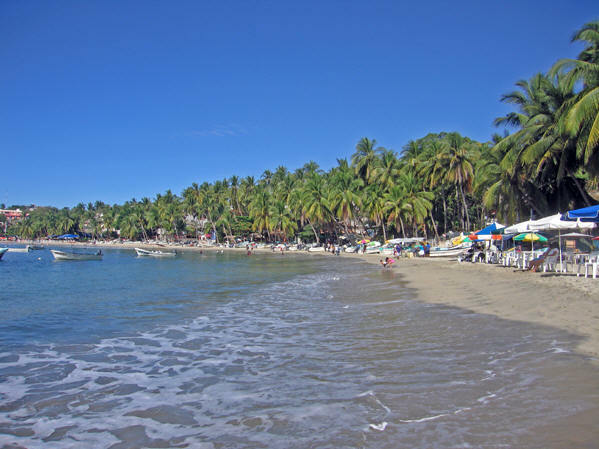 This is Playa Principal which is a pleasant walk north from Playa Zicatela, and through Playa Marinero which is where we usually body surf. 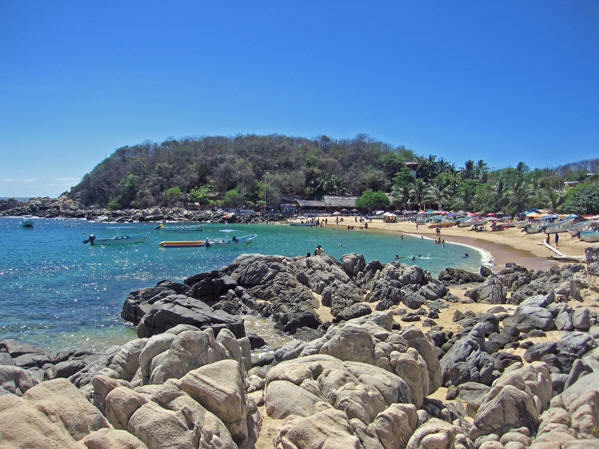 Playa Principal fills with the local population on the weekends where families enjoy the food, the sea and their own company. 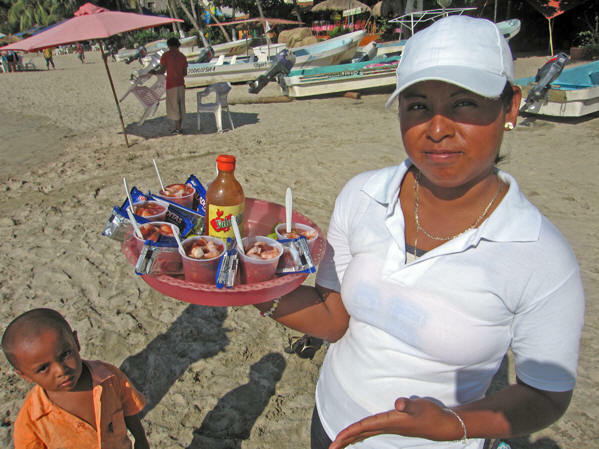 This vendor walks the beach offering fresh shrimp cocktails with crackers and salsa for 25 Pesos each cup. 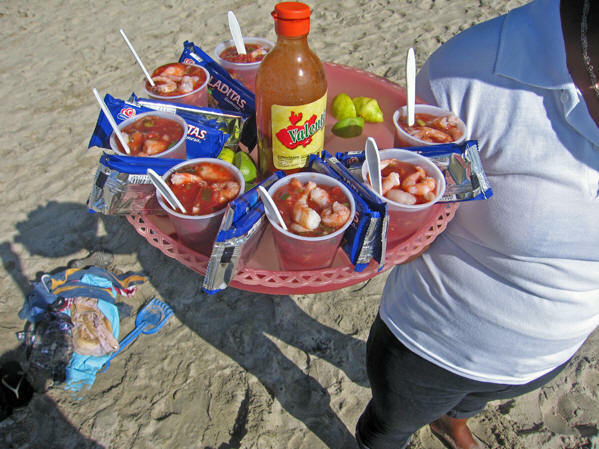 The shrimp are in clam juice and fresh salsa made from cilantro, onions, tomatoes and red sauce. With a squeeze of lime and a touch of Valentino's... Marvelous! Do try these treats otherwise you will never know what you are missing. 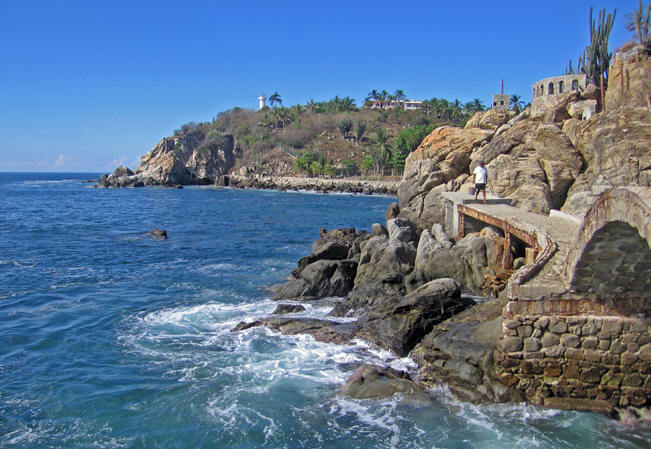 After that tasty snack we head on to our destination for the day, Playa Manzanillo. 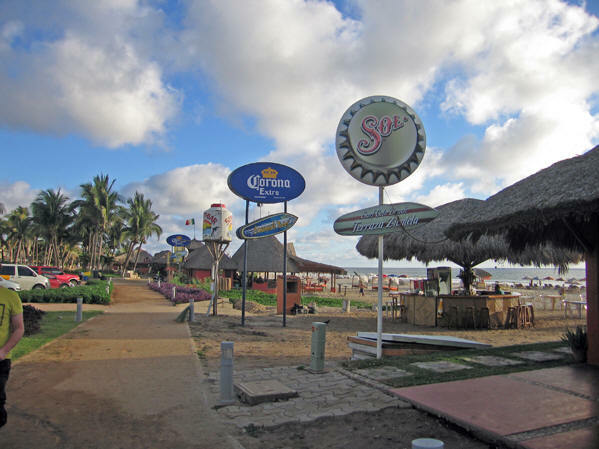 You can pick up this paved walking tour just past Playa Principal and it's a pleasant walk, not strenuous at all. It's a good way to see the cerulean waters, jagged coastline and a bit of jungle. 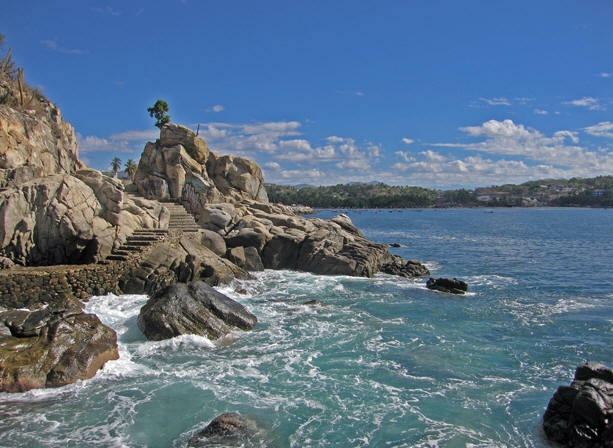 Some areas of the walking tour are exciting with the crashing surf splashing right over the paved areas. 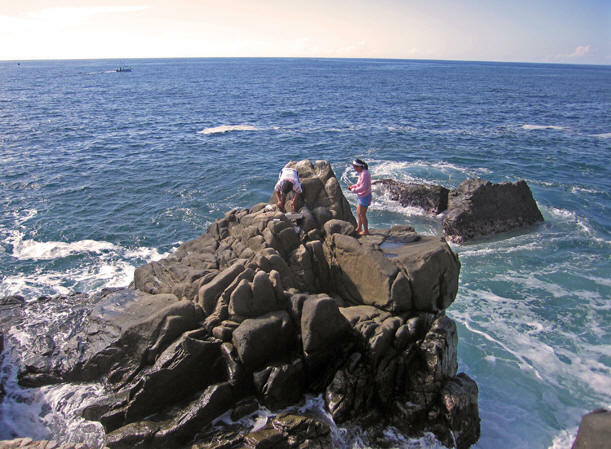 This couple are doing a bit of fishing here on the rocks. Crabs run all along this area and are exposed when the tide is down. How did they get out there? And how will they get back? You can only reach this destination when the tide is down... The water pool on the flat surface just to the right of the girl shows that waves were crashing over this rock formation earlier. From the path looking back towards Playa Zicatela on the upper right. You can see that the constructed walkway is in good shape and blends in well with the natural surroundings. There are plenty of places to rest, enjoy the view and preserve the moment in a photo. Could this be the title of our next book? Taking our time it was just over an hour before we arrived at the end of the trail. 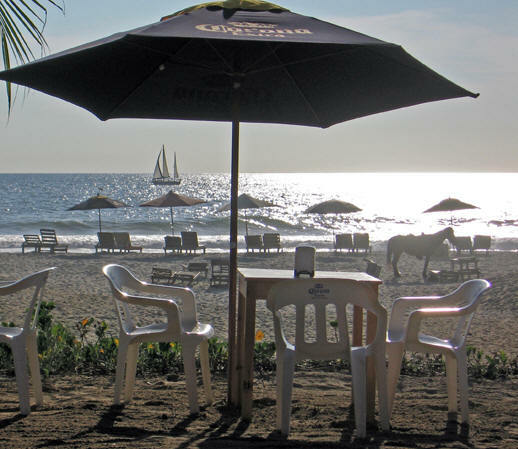 Continue past Un Sueno Posible and take the first left into the beach area where you will find palapas and restaurants on gorgeous Playa Manzanillo. 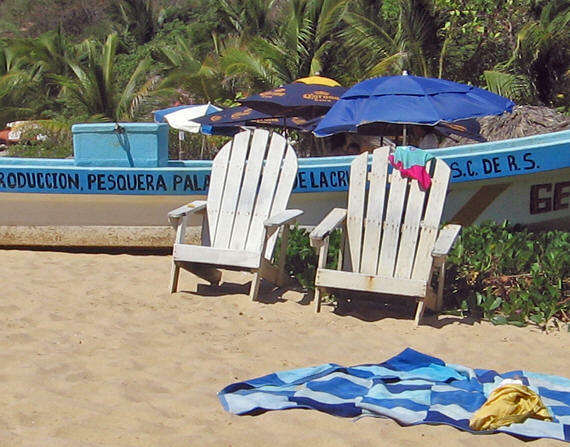 Boats, beach towels, comfortable seats and white sand. The water here was FRESH feeling, clean, clear, no trash at all and the waves were gentle, lapping at our feet. The beach drops off suddenly and the water is over your head before you know it. Pay attention - the cabana boys might tell you the umbrellas are free but you will be expected to purchase something at their restaurant. Otherwise rent for the umbrella is 50 Pesos a person. Here's a broader view of the same bay. 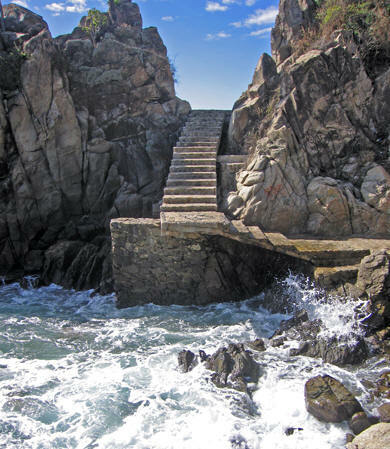 These sea worn rocks separate the bay into two distinct areas. Cars and taxis can service this side. Colorful umbrellas, boats, restaurants, even a 'banana' ride. We walked through this beach, continued on the path to Playa Angelito and up a steep hill where we ate lunch at Mar y Sol. This small restaurant, built into the cliff, had a spectacular view and good service. Our full plate of whitefish with garlic butter, rice and salad went for 40 Pesos per person. After lunch we hailed a taxi. Five minutes and 30 Pesos later we were back in Zicatela. In Zicatela once again, we discover more designer chairs under canvas shades. 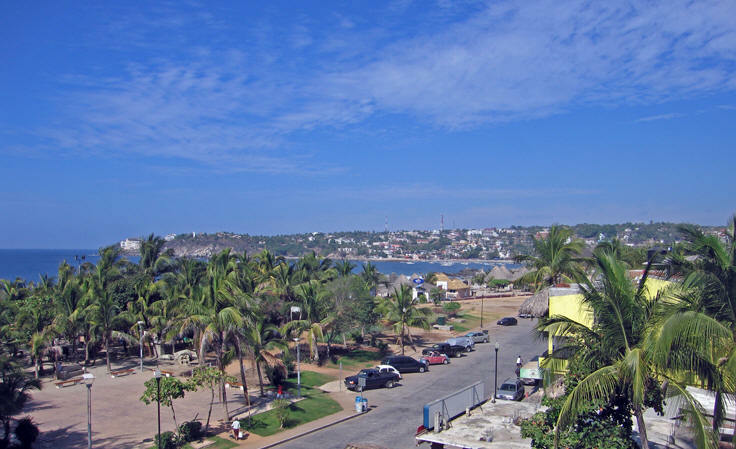 In the upper right hand corner of this photo, you see the location of Un Sueno Posible and other hotels we passed to get to Playa Manzanillo. One evening we were walking around the area and some troubadours asked us where we were from, where we were staying, and where we were going to eat dinner. Be careful what you disclose about yourself! People may appear friendly, but are actually sizing you up. We asked to hear a popular ballad, Besame Mucho, and it was the best duet version we have ever heard of this song, and heartbreakingly romantic. Later when we tipped them for their work they became offensive and rude, because they expected more. It's unfortunate that one must be less-than-truthful about yourself in these situations, but if you are not, you can find that you have placed yourself in an unwanted and possibly dicey position. Lovely sea view table at Restaurant Elizabeth where we ordered dinner on another evening. 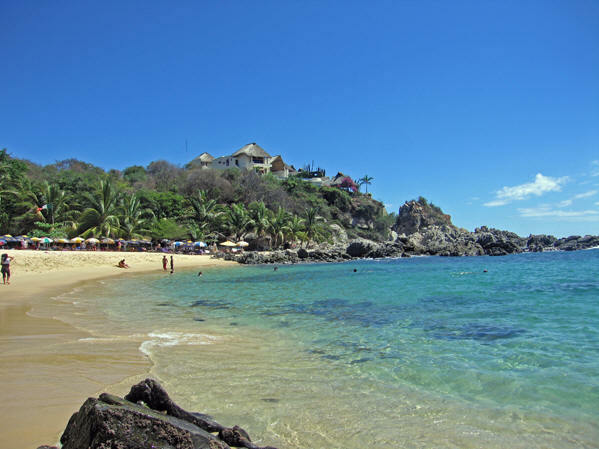 Sailing, surfing, sun-worshipping, horseback riding, hiking, swimming, and fine dining. 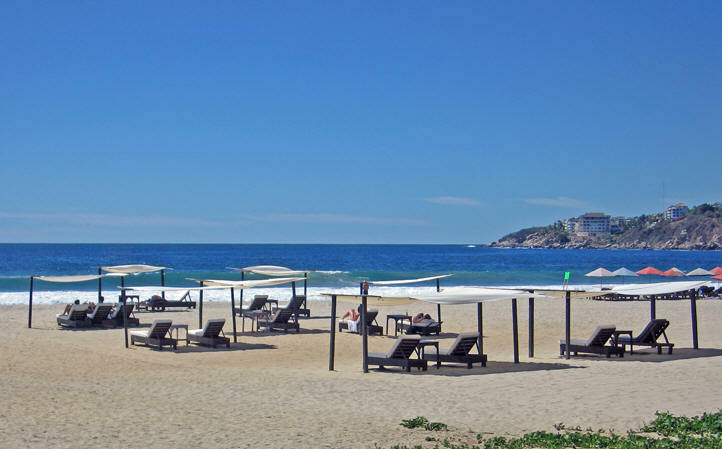 What more could one want from a beach location?